Fifteen of the 28 EU member nations are seeking to keep genetically modified organisms out of all or part of their territory, as the deadline for opting out of new European legislation on GMO crops nears, the bloc's executive arm said Thursday. The growing list of members which in a blow to the biotech industry want a total ban on GMO cultivation in their fields, includes EU heavyweights Germany and France. Also on the total opt-out list are Austria, Bulgaria, Croatia, Cyprus, Greece, Hungary, Italy, Latvia, Lithuania, the Netherlands and Poland, an EU Commission spokesman told AFP. Belgium has opted to keep French-speaking Wallonia region GMO-free. Members states have until October 3 to opt-out of the new EU-wide legislation on genetically modified crops. Those national demands must be put to the big agricultural multinationals, including the likes of Monsanto and Dow, in order to prevent the cultivation of GMOs already authorised by the EU, or in the process of authorisation. The EU had already cleared over 70 genetically modified products including human food, animal feed and cut flowers. The agro companies have the right to oppose such calls for these GMO products to be banned from individual member states. If they do so then member states can still invoke "substantial grounds", for example specific environmental or agricultural issues, for a ban. The legislation crucially allows member states to ban GMOs on environmental policy considerations, even if the crop has already been cleared on health and safety grounds at the EU level following a manufacturer's request. Some EU nations fear GM foods pose a potential threat to public health and could affect the reputation and integrity of their local agricultural produce. For others GMOs represent an essential technology that cannot be ignored and is key to feed a growing world population. With neither side able to prevail since the new legislation was first mooted in 2010, EU leaders thrashed out a compromise last year to hand the final decision back to national governments. 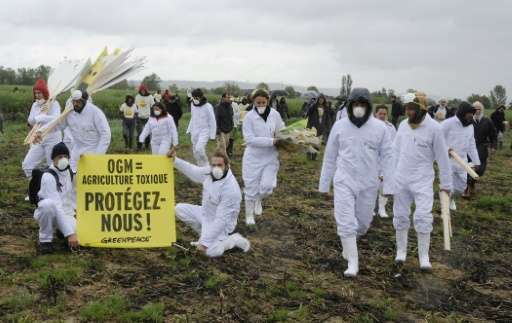 Supporters of GM products and the manufacturers had argued that if the EU found no health reason to ban them, then individual member states should have no reason to prevent their cultivation. Some critics say the compromise looks good at the headline level but in practice it will allow GM foods in by the back door, arguing that a general ban would be much more effective than a patchwork of GMO regimes.